Speed across the country in exotic cars! Wild Race lets you drive the Panther Turbo, Venom Smirk, and Tiger Rush. During each trip, you can pick up letters to unlock the bonus mission. Change lanes to gather magnets and coins! 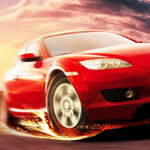 Wild Race is one of our selected Car Games.